A couple of years ago, I don’t remember how I heard about it, but my grandfather published a book, about his life. Now I’m plugging it, but not as a great literary masterpiece. Indeed, I don’t believe it was intended as such. I mean, even I, poring over it and rushing through to discover what gems of memories the next page held, with rose-tinted glasses, spotted a few typos and spelling mistakes; and worried overtly about the over-use of exclamation marks. (Although granted, when subject matters such as being held captive at the spear-ends of a thousand tribal warriors are being discussed, there may not be enough exclamation marks one can insert to illustrate the mood of the situation). No. What really struck me, even before half-way through, was that you can know someone your whole life – a parent, grandparent, even a close friend who mimics any of these relationships, and you still won’t know everything about them. If they’re older, they had years and years of a whole other life even before you were born, let alone since you were old enough to remember. Even tidbits of memories and information and the odd photograph that another mutual relative or friend may share with you about the person in question, can’t quite make up for the said relative recounting their own whole life in memories and photographs, and setting it out in a format that will be around long after they’ve gone. To put a bit more gravitas on this, the subject in question is my paternal grandfather (adopted, also great-uncle by marriage but the vast complications of my weird and wonderful living-memory level heritage can be dealt with at a later date. Although, incidentally it’s pretty much explained in the book!). At almost the very same point in time as he was putting this memoir together, the corresponding memories my maternal grandparents may have had, were slowly becoming lost to us. Little did we know at the time, but by now, the two wonderful people who featured so heavily in my life, and those of my siblings and cousins and aunts and uncles, are both, happily living in oblivion, physically quite good specimens for their ages but mentally, all but totally unaware of who their own children and grandchildren are when any of us visit them. My maternal grandfather can wake up from a nap, speaking to whosoever is nearest in perfect Italian, believing he is back there in the height of World War Two, or visiting with his wife years and years later, ordering a bottle of a restaurant’s finest wine in native tongue and being mistaken, with his jet black hair even late into life, for a local. My grandmother can be sat watching the tennis in the TV room, and tell my aunt (whom she does not recognise, and believes to be the latest care-worker) in all seriousness how she was there just yesterday, sat next to Val Doonican near the Royal Box. Blissfully unaware is she that this memory is from the safety of her own little dreamworld. The fact that this book by one grandparent, and the deterioration in the mental states of others, all seemed to happen around the same time, really brought home to me one thing – we should all take the time to document our lives. I still have countless relatives who can recount tales, memories, share photographs, of my maternal grandparents, but there are things about their lives that only they would have been able to tell me. The fact that I can still go and sit next to them, and offer them a cup of tea, and chat about how nice the sun is, sitting in the conservatory, only serves as a poignant reminder that the stranger sat next to me was so much more, at least to me, just a few very short years ago. We can’t all say that we were bomb disposal experts during the blitz, or best mates with the earliest TV pioneers. We can’t all claim to have traveled the world extensively, we’re not all novelists or artists; we won’t all be remembered for our amazing cooking or leave behind wonderfully hand crafted wooden love-spoons. And no, not everyone who writes a book will become a New York Times Best Seller. But, the odd little world of vanity publishing is becoming not so little any more. It may well result in a load of self-gratification drivel flooding the bookshelves of Hay-On-Wye in the future; but on the other hand, in years to come, a tangible, touchable copy of the inside of your mind may well be the most precious thing you could leave for your children, grandchildren, and all those who come after. 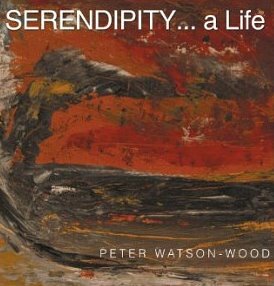 Peter Watson-Wood’s memoir “Serendipity … a Life” can be found on Amazon and on his website.